Mix the yeast, sugar and water in a large bowl or in the bowl of a stand mixer and let it stand five minutes or until the yeast is frothy and bubbly. Add the orange juice, aquafaba, oil, flour and salt and 2 cups of flour and mix until the dough comes together. Continue to add flour, 1/4 cup at a time, until you have a smooth, pliable dough that doesn't stick. Continue to knead a couple more minutes. Form the dough into a smooth ball and place in an oiled bowl, turning the dough over once to ensure it is coated with oil. Cover tightly with cling wrap and set aside in a refrigerator overnight. If you want to make the rolls the same day, set the dough to rise in a warm place for 1-2 hours or until doubled. In the morning, or when ready to shape the rolls, punch down the dough and roll into a rectangle 12 inches long and six inches wide. Spread the orange marmalade for the filling on the surface of the dough. Starting along the long seam, roll the dough as tightly as possible until you have a cylinder 12 inches in length. Cut the dough into 10-12 pieces, equal in size if possible. Place each roll, cut side up, in a 10-inch round or square pan. I used an 8-inch cake pan and things were a bit tight in there which made the rolls rise rather high, but you can use an 9-inch pan if that's your only option. A 10-inch cast-iron skillet would work well too. Cover the rolls with cling wrap or a kitchen towel and set aside to rise in a warm place for an hour until they are puffy and risen. About 20 minutes before baking, preheat your oven to 350 degrees. 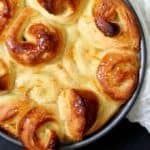 To bake, place the orange rolls in the oven and bake for 28-30 minutes or until browned on top. Mix all the glaze ingredients with a whisk. If using vegan butter, make sure you melt it first.